While old-style patio doors were notorious for heat loss, leakage and poor security, modern doors offer significant improvements. Today, quality frames and glass are more energy efficient and weather-resistant and many products incorporate multi-point locking mechanisms for better security. With so many choices when it comes to patio door styles and materials we made this guide to help you make the right decision for your home. As with any window or door replacement project be sure you hire a reputable company with high-quality products and a comprehensive warranty so you can be sure you are getting the best products and installation for your home. Choosing a patio door style often comes down to a matter of aesthetics and functionality. Below are three of the basic patio door styles and a brief description of each. Sliding Patio Doors – sometimes called gliding doors, bypass doors, or slider doors – are extremely popular. They let in a lot of natural light and are easy to maintain. Slider doors consist of two or more individual panels, at least one of which slides back and forth on hidden rollers. The sliding panels can combine with fixed panels to create dramatically broad expanses of glass. Panels slide parallel to the wall so they don’t interfere with furniture placement or walking areas. Sliding doors are often used when space is limited because swinging doors need room to swing inward or outward when opened. Swinging Patio Doors – sometimes called hinged patio doors, operate in much the same fashion as standard exterior doors. They are full view glass panels and often hang in pairs. The doors are center hung, hinged on either side of a central mullion, and open much like butterfly wings. A second type of hinged patio door is the French door. French doors are hinged at the side jambs so that the door panels meet when closed. The latching mechanism is contained in an astragal mounted to one of the doors. When French doors open, the entire area between the hinges is clear. Folding Patio Doors – a folding patio door system can open a wide area to the great outdoors. The system operates accordion-style, which means each section slides on an overhead track and neatly folds away for full access. They are available in several configurations, ranging from two to eight leaves. While design options can seem almost endless, for construction it comes down to 5 materials: vinyl, steel, aluminum, fiberglass, and wood. Your choice depends on what factors are most important to you. Vinyl patio doors are one of the most common options to consider. The strong plastic material can be designed to mimic more stylish materials. Colorful exterior frames can match the design and style of your home and tinted glass can also be added. Customize even more with metallic interior handles. Vinyl is durable, low-maintenance, and stands up to the elements without peeling, flaking, rotting, or corroding. 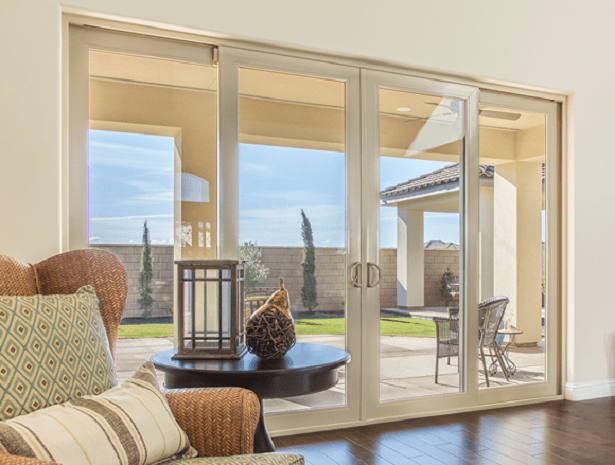 Vinyl patio doors are inexpensive, cost-effective, and very energy efficient. There are a few minor issues with vinyl patio doors. First, extreme temperature shifts can potentially cause cracks in the vinyl. Second, vinyl can be more flammable than some other patio door materials. Still, both of these issues are relatively minor compared with the benefits this patio door material provides. An economical option, steel offers strength and durability and is a good choice for most climates. They may not be as stylish as wood patio doors but they are more energy efficient and less expensive. Steel patio doors require less maintenance and shouldn’t bow or warp if they are properly installed with quality materials. (HINT: In especially moist areas, steel patio doors may require more upkeep). Fiberglass patio doors are built to consistently withstand the rigors of any climate. They expand and contract very little with temperature changes in the weather which also makes them energy efficient. They are extremely strong, resist rotting, and can be designed to mimic the look of wood making them a good choice for homeowners who like the style of wooden patio doors, but want a more low-maintenance option. Wood patio doors provide an elegant, traditional style for your home due to the distinctive appearance and finish of wood. Scratches and similar small damage can repair easily, which spares homeowners big headaches. However, wood patio doors are very expensive and less energy efficient than other materials. Since wood is a natural material, these doors require constant upkeep, which can be a hassle. Furthermore, moisture in the atmosphere can actually warp wood-based patio doors, and extended exposure to sunlight and heat can cause the wood to fade. We hope this guide has been helpful. If you have any further questions, don’t hesitate to contact us. We’ll be happy to answer any patio door questions you may have.